We currently have two BFB 300 FDM machines for rapid production of components. We currently have two custom-built machines (designed and built here at the University of Warwick) which can be tailored to use a whole host of different materials while delivering a range of layer thicknesses and feature sizes. These machines are permanently being developed so as to deliver high performance and exceptionally detailed components. The Perfactory® Desktop System is designed to support Rapid Prototyping and Direct Manufacturing with a low cost, high resolution solution. 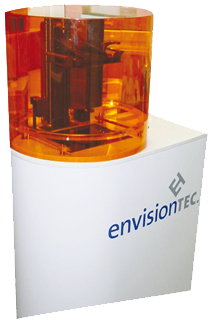 Based on the principle of Photopolymerisation the Perfactory® Desktop System creates three dimensional resin models through a patented Digital Light Processing System. 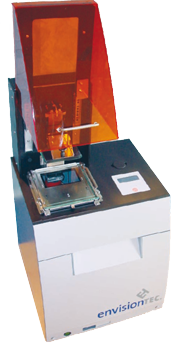 The Perfactory® SXGA+ is a low cost, easy maintenance and user friendly three dimensional Rapid Prototype Manufacturing System. Using state of the art Direct Light Projection technology from Texas Instruments, the Perfactory® Standard System produces the finest detail in the shortest period of time. The Perfactory® Standard System creates three-dimensional models that range from the conceptual to the fully functional. Our laboratory area allows for a controlled working environment when using photosensitive materials, along with safe chemical handling facilities.